NEWLY-RENOVATED ROOMS! Retreat to spacious new accommodations at Courtyard San Antonio Airport/North Star Mall boasting complimentary Wi-Fi, flat-panel TVs and plush bedding. Located less than 2 miles from San Antonio International Airport (SAT), our newly renovated hotel along Loop 410 features convenient perks for all types of travelers. Step into our state-of-the-art lobby where you'll find free Wi-Fi and media pods with plenty of spaces to plug in, then grab a bite to eat in The Bistro, serving up fresh fare for breakfast and dinner daily. Get rid of leftover energy in our state-of-the-art fitness room and indoor pool. For fun off site, visit popular destinations including North Star Mall, located minutes away, as well as SeaWorld and Six Flags Fiesta, just a short drive from our hotel. Need a place to meet? Reserve our high-tech event space for small business meetings or social celebrations. 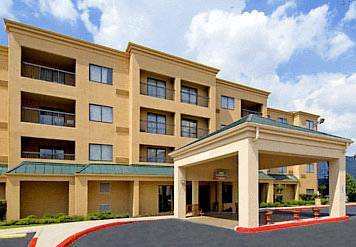 Start planning your next trip to our North Star Mall hotel today!